On the 5th March at 12:05pm on Channel 4 series two of Baking Mad with Eric Lanlard begins! This series sees Eric, the master of all things sweet and beautiful, at home in his kitchen conjuring up quick baking recipes alongside his signature glamorous desserts. Each 30 minute episode will also feature three members of the public who will come to his cookery school, Cake Boy, to demonstrate their baking skills and take part in a 'Bake Off'. 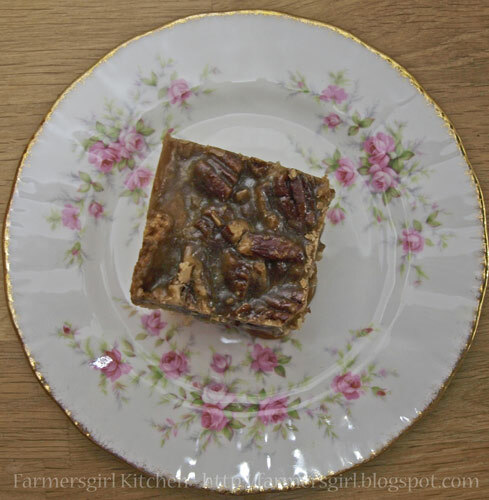 I was asked to try out one of the recipes from the new series and chose to make these Maple Pecan Sticky bars. The recipe is easy to follow and the result is a gloriously sticky sugar hit! Preheat oven to 180°C/160°C fan/350°F/Mark 4. Butter a 23x23x5cm cake tin. To start, make the short crust pastry base. In a large bowl mix together the butter and sugar with your hands, and finally add the egg yolks and mix. Add the flour and beat until a soft dough is formed. Gather the dough together and press it into the bottom of the tin and 2cm up the sides. Bake for about 18-20 minutes, or until golden. Remove from the oven, but leave the oven on whilst you make the filling. 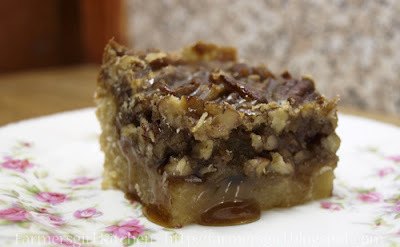 To make the filling; in a medium saucepan combine all the ingredients except the nuts and vanilla extract. Bring to the boil, stirring until the butter melts and the mixture is smooth. Boil for 30 seconds. Remove from the heat, then mix the nuts and vanilla extract. Pour the hot filling over the crust and bake in the oven for about 15 minutes until the filling is bubbling in the centre. Allow to completely cool in the tin where the filling will become firm, then chill in the refrigerator for at least 1 hour and up to 2 hours. When chilled, cut into bars with a large sharp knife. I didn't have a tin 23cm x 23 cm mine is more like 21cm, so my pastry is a tad too thick and I think I could have baked the filling for a little longer as the maple syrup started to ooze out when it was cut, however that just means I'll need to make it again! I took some up to my son when I visited him in his flat and both he and his flat mate gave them the 'hollow-legged young man' seal of approval. SNAP! I have also been asked to bake something for this event! LOVE the look of these Janice, but then I like maple syrup and pecans! I am making these too Janice. They called out to me and boy do they look good! These look gorgeous and just the sort of decent treat I keep trying NOT to make!!! I've made one of the recipes too but mine was far more restrained. *giggles* a moment on the lips a lifetime on the hips...sometimes it is useful to NOT be rated as a food blogger;) these look WAY too good to keep Janice! Oh yes they do look very very good!